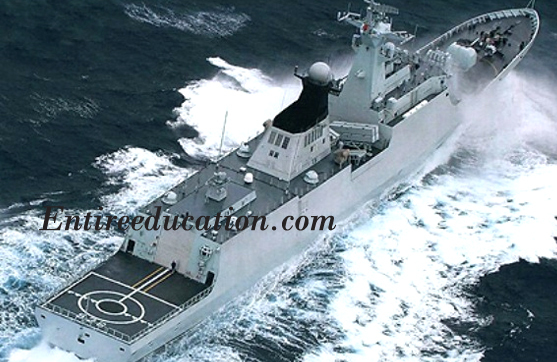 Pakistan Navy is one the prestigious organization committed to ensuring the defense of Pakistan borders through the sea. Pakistan Navy inducts Naval Officers through short service commission to make them able to serve their motherland. The Navy provides training in the field of education, prepare them mentally and groom the skills of the cadets and develop them as professional Naval Officers. The Pakistan Navy inducts professional officers of the operational branch, education branch, information technology, weapon and marine engineering, medical and supply chain branches as well. After a successful one and half year training at Pakistan Naval Academy (PNA), cadets get the rank of midshipmen and join shipping department for further education and training. At fleet, they will be given an experience of living at sea while learning new things in different areas abroad. After completion of 6 months training on the ship, the candidates will be granted the rank of sub-lieutenants. All the candidates will be provided with free messing, uniform and accommodation during the training period. After completing professional courses and engineering degree, all the officers will be appointed on-board ships for getting their certificates in watchkeeping. Officers join mechanical branch for further training of 2 ½ years at Pakistan Naval Academy engineering college in the field of mechanics. The training program will earn them Bachelors in Mechanical engineering from the National University of Science & Technology. These officers will join the school offering training in the logistics and management, which is affiliated with Pakistan Naval Academy and Institute of Business Administration Karachi. This training program will earn them a BBA (Hons) degree in logistics management and then, later on, join ships for obtaining competency certificates. All the Male/Female candidates with 16 to 23 years of age, whether serving candidates or civilians can apply for this. Only unmarried candidates will be allowed to join the Pakistan Navy. However, the applicant should fulfill the minimum height (5′-4″) required to be eligible for the induction in this course. IF any candidate is rejected by the AHQ, GHQ and ISSB Board two times. Two times rejected by ISSB. Declared as permanently unfit by any board.In a case, where candidates were tested by the respective board in the period of 1 years are considered ineligible. A candidate is expelled from the institutes of Armed Forces on any ground. Debarred/Dismissed from the Government Service and Armed Forces of Pakistan. A candidate, involving in the moral turpitude and declared as convicted by the law.If any candidate is positively diagnosed with hepatitis A, B or C is unfit for the Navy. If a candidate conceals any fact/information or alters any academic certificate for the purpose of gaining an advantage of being selected by the Pakistan Navy will be declared permanently ineligible for the Armed Forces. Thanks for visiting our site which is compatible of Universities Admissions and details. We provide the best information about Join Pakistan Navy Officer through Short Service Commission Induction 2018. You will apply in PAK Navy for officer post. But our medical staff will check your eyesight and then decided that either you will eligible for further test or not. i hve passed my matricullation with 70% marks. can i able to join force.. or if i m able so can i continue my stadies with training?? Yes, you will eligible to apply in PAF as Female Medical Assistant. But currently induction for female medical assistant has been closed. When new induction announced then we have updated on the website. M DOING BS.C(PHYS,MATHS,CHEM)SO.CAN I JOIN PAK NAVY AFTER THIS? Student having the degree of BSc in Physics, Mathematics and Chem will eligible to apply in Pak Navy after MSc in Mathematics. plzzzz sir tell me which field is best for me…………i have mention my qualification plzzz sir guide me ………. I have already said you if you proceed your study in MSc Mathematics than you will eligible to apply in Pak Navy as Short Service Commission officer. aoa….i have done my B.Sc. (Hons) in major biochemistry….can i join Pak Navy with this educational background?? am i eligible for any (recent) department there?? Student having the degree of BSc(Hons) Bio Chemistry will not eligible to apply in Pakistan Navy Education Crop. now that i have done my Hons, and want to join Pak Army (maybe PAF)…am i not eligible at all for any disciple there or is there any way through for me? now that i have done my Hons, i want to join Pak Army (or PAF)…am i not eligible for for any disciple there at all or is there any way through for me? Yes, you will eligible to apply in Pak Army as 2nd Lieutant and in Pak Navy as officer. Currently Pak Army entries announced from 06 April to 06 May. You apply online through official webpage of Pak Army. aoa. i have done my llb from iiui.. m i eligible in legal branch of pak navy.. and can u tell me plz when selection for female candidates is going to start? Assalamoalaikum ,sir i have done b.s in mass communaction this year, i want to join pakistan navy as a officer, can i apply plz guide me. hve passed my matricullation with 70% marks. can i able to join Pakistan Air Force.. or if i m able so can i continue my stadies with training? ?